On average, everybody works around 40 hours a week. When you’re not working, you’re raising the kids, doing the shopping, cooking the meals, and cleaning the house. You’re so busy that you wonder how you’re ever going to rewrite your resume, let alone advance your career. There’s no way you can afford the time it would take to go back to school. It’s too bad because an advanced degree would really help you land the promotion you know you deserve – and make your resume stand out from all those other military resumes or non-military resumes. 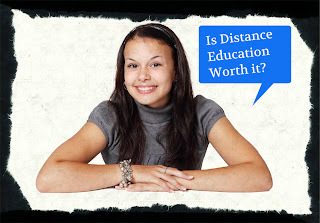 Have you ever thought about pursuing distance education? This type of instruction creates a virtual classroom that anyone can attend from anywhere. If you’re contemplating this option, consider these factors. The virtual classroom is totally convenient. Often, you can attend class when you want to. If you’re busy with the kids or work, you can still go to class right before bedtime (while you’re in bed), or in the early morning, while you’re eating your cereal. And, there is no long commute time or additional costs, such as parking, to worry about. You’re there; ready to learn, as soon as you log in on your computer. Live lecture or video instruction (via web chat) can be a rich and totally effective method of learning. Forget about conventional learning with one teacher in a huge lecture hall. This experience is different from traditional methods. You can really benefit from an elaborate design and multimedia displays. Academic experts say that this can add up to better retention for students who do better with one-on-one instruction. Since online course materials are accessible all day and all night, students can read and reread lectures and discussions as often as they need or want. That means you can review the lectures as often as you please. You can’t do that in a traditional college setting. Online instructors often bring a special brand of practical knowledge to the virtual classroom. This provides them with exposure to real-life skills they can’t find in a textbook. It’s powerful and effective to learn from a professor who is actually in the trenches of the field that you’re studying. What about making friends? You may be wondering if distance learning is isolating. But guess what? Online programs offer many opportunities for students to bond with each other. There are chat rooms, which are set up for informal conversations between students, professors, as well as study groups to tap into. Although the idea of online learning has been in existence since the advent of the Internet, there’s still some resistance before enrollment. But recent studies show that distance education is becoming more and more popular. Presently, there are more than 12 million students who attend virtual classes. Can this type of knowledge system be right for you? We definitely think so!